Akiles has done it again with an innovative and convenient Wire-O Binding Machine that is not only a high quality product, but is also affordable. 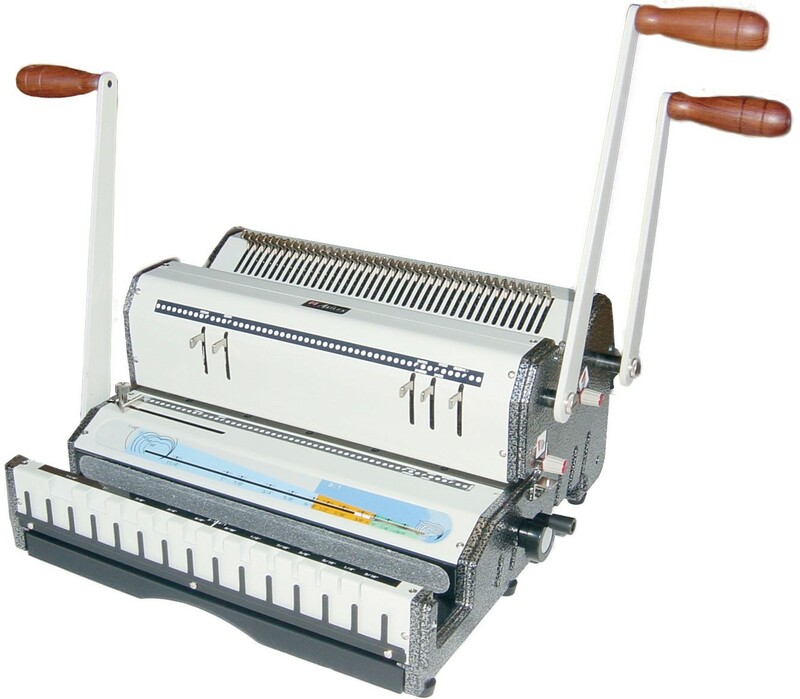 Manufactured with all-metal construction, the Wiremac-Duo all-in-one Wire-O binding machine is unique in its ability to punch and close both the 3:1 and 2:1 pitch wires, giving consumers the versatility to bind any book size using just one machine. The Akiles WireMac-Duo is based off of the best-selling Akiles WireMac-M, but has taken the initiative by providing both Wire-O punching patterns in one compact binding machine. Unlike many “all-in-one” machines, The Akiles Wiremac-Duo does not require any die changing to switch from 3:1 and 2:1 pitch wire punching and closing. It features dual punching throats with a 14” capacity, and an extra wide wire closer to accommodate Wire-O sizes as large as 1-1/4” in diameter. 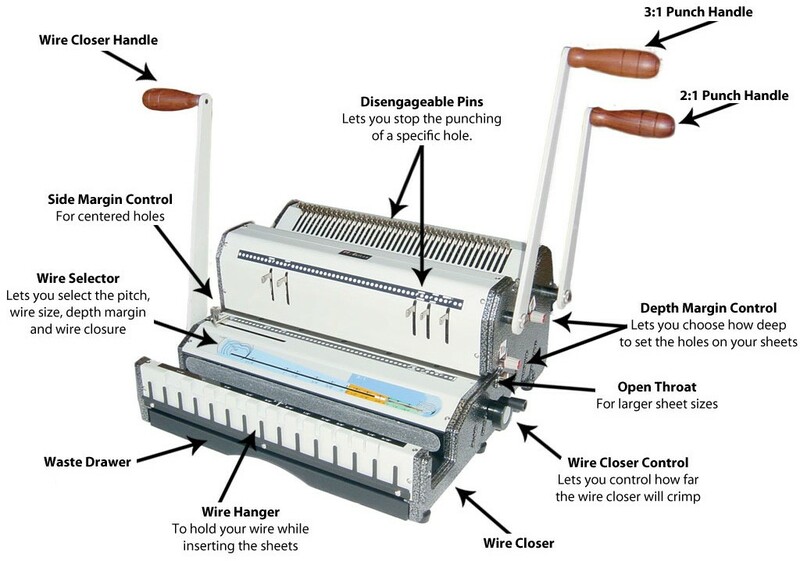 This new Wire Binding System is all you need to punch and bind from 2 to over 200 sheets. Another unique feature on the Akiles WireMac-Duo is the fully-disengageable punching pins. These pins control where holes will be punched, and can be easily disengaged by simply pulling the metal pin. Many wire binding machines require you to remove the die and fully remove the pin before punching can commence, but this machine lets you simply pull the pin, and push it back; easy and effortless. Fully disengageable pins allow consumers to punch any size document while preventing partial side-end holes on your sheets. Although the throats are 14” wide, they are open-ended, meaning that a consumer can bind any large document by simply using a two-punch process. In addition to these important features, the WireMac-Duo also has depth margin control guides that let you control the size of your binding edge margin from as small as 1/16” to as large as 3/16”. Side margin control is also a standard feature and is easily adjusted by simply loosening, sliding, and tightening the notch to the desired position. These adjustable controls are important so that each individual user can choose the optimum margins for the thickness of their book, helping them to ensure the proper strength. The handles on the WireMac-Duo feature an ergonomic design that is comfortable and easy to move. Something as simple as a rotating handle makes the binding process much more contented for any user, eliminating any possibility of wrist and operator fatigue by letting the operator keep their arm straight when pulling the handle. The rear handle on the right side of the machine activates the punching for the 2:1 pitch throat, and the front handle on the right side of the machine does the same for the 3:1 pitch throat. On the left of the WireMac-Duo is the wire closer handle, which can be easily adjusted using the crank on the right side of the machine. The only limitation of the Wiremac-Duo is that the location of the punching handles is ideally placed for right-handed users, so a left-handed operator will need to reach across their body to punch their paper. Because the WireMac-Duo has a variety of great features, it may also look a bit intimidating with the many buttons and handles. While it may take some time to learn all of the operations, with a little practice, the Wiremac-Duo will quickly become your favorite binding machine. When looking at the big picture, we have seen that the Akiles WireMac-Duo continues to hold the book binding heart of all its operators with its ease of use and convenient features that save space, speed up the binding process, and arguably most importantly, save money by eliminating the need to purchase multiple binding units.